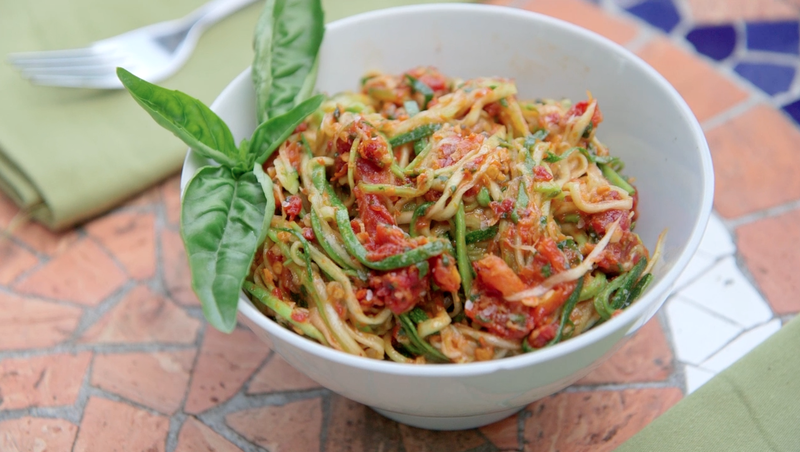 In this second installment of the Local Food Rocks + Max's Best Bootcamp Recipe of the Week video we show you another easy, delicious carb/starchy food alternative - Zucchini Noodles with Sundried Tomato Pesto. I have to admit that I was skeptical about this whole concept of faux noodles. I'm unashamed of my pasta love - could this really satisfy? It's actually really good! It gives you the sensation of a noodle; I could even twirl it. I definitely think the sun-dried tomato pesto gives you that added traditional spaghetti dish taste and feel. I'll never give up my spaghetti but I am totally sold on this as an alternative. Plus, it's great addition to my arsenal for tackling the annual summer zucchini explosion. You don't really need any specialty equipment ( like a spiralizer) to make these "noodles." I had a hand peeler with a julienne blade, but you could also use a box grater, mandoline or even a regular hand peeler. If you use a regular hand peeler the noodles will just be wide like pappardelle. To make the noodles, slice the zucchinis into noodles on a spiral slicer, mandolin, cheese grater or hand peeler. Set aside in a large bowl. To make the sauce: In a food processor add the tomatoes and basil. Roughly cop the garlic clove and add to the food processor. Add the lemon juice, olive oil, salt and pepper. Put on the lid and pulse until finely chopped. Mix the sauce onto your zucchini noodles and let it side for 10-15 minutes. This lets the flavors come together and softens the noodles. Mix again and if desired, sprinkle with crushed red pepper. Serve. SO simple and SO healthy.... the perfect summer dish! Thanks for the inspiration. You are so welcome. Glad you like it. Yes! So glad you asked me to do these with you. 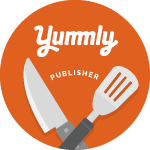 Delicious fun!